Penn State Football: Is Blake Bortles’ NFL Draft Success a Bellwether for Christian Hackenberg? 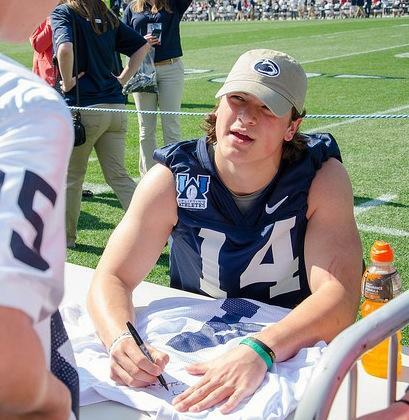 Penn State quarterback Christian Hackenberg signs autographs before the 2014 Blue-White Game. Photo by Mitchell Wilston, Onward State. Hackenberg, O’Brien, Bench, Franklin and Bortles. Thursday night, on the opening night of the NFL Draft, none of those five were at the same place they were for the 2013 draft. Christian Hackenberg is closest – and even at that, he has landed 307 miles from where he was on Thursday, April 25, 2013. 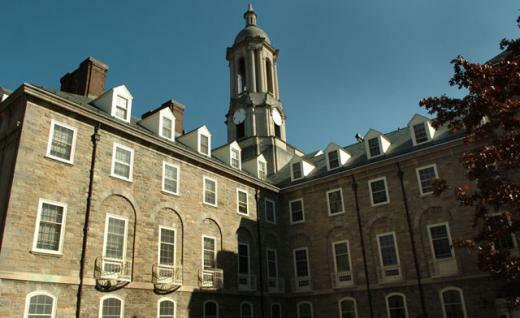 On that night, Hackenberg was at home in Palmyra, Va., a prep school senior about to graduate and getting ready to head off to Penn State in just seven weeks. He had committed to play at Penn State, he played at Penn State – boy, did he ever – and he remains at Penn State. He won Big Ten Freshman of the Year honors, engineered a couple of big victories over ranked opponents and registered one of the finest passing seasons by a Nittany Lion quarterback. Ever. For Hackenberg, and Hackenberg only among that aforementioned group, the 2014 Draft doesn’t signal winds of change. Everyone else? Uh ... yeah. The guy in the second row of the Houston Texans’ war room Thursday night looked familiar. Bill O’Brien was wearing the same semi-scowl and black polo shirt with thin horizontal white stripes that he favored when he was Penn State’s head coach. Last year during draft week, O’Brien was in Chicago for a Big Ten coaches conference, then straight-shooting in individual player meetings, then getting ready for his second Coaches Caravan, slated to begin in a few days outside of Reading. The primary kid at the end of one of those straight shots left Penn State during last year’s draft week after being told his practice snaps would be cut. Hackenberg’s presence loomed and Tyler Ferguson – who would also later transfer – relegated Steven Bench to the bench and then out the door. Bench surfaced at the University of South Florida, where he played in seven games and started two, completing 26 of 68 passes for 128 yards, one TD and three interceptions. He went wild in USF’s spring game, completing 19 of 24 passes for 392 yards and three scores. The head coach of Penn State for all of 17 weeks – a third of a year -- James Franklin was standing on the big stage in the Grand Station Ballroom of Pittsburgh’s Sheraton Square Station on Thursday night. It was the seventh stop of Penn State’s 2014 Coaches Caravan. Franklin was rightfully basking in the blue-lit glow of a broad and fast recruiting effort last matched in “The Dirty Dozen,” when Lee Marvin signed on Jim Brown, Charles Bronson and Telly Savalas (he of the James Franklin-like pate). It was undoubtedly a step up from Draft Day Eve in 2013, when Franklin made his only major public appearance of the week – a 15-minute stint on “360 Golf,” a debuting radio show that featured Vandy athletics. Funny, since Franklin, who had put Vanderbilt football on the Top 25 map, has played maybe two dozen rounds of golf in his life. On draft day last year, two of Franklin’s players were picked by the NFL (Zac Stacy and Ryan Seymour), and at least four more Commodores signed as free agents. A year later, as O’Brien’s successor, Franklin has Penn State on a new course, not only recruiting blue-chip high school football players, but disenfranchised Penn State fans as well. Then there’s Blake Bortles. A case can be made that the former Central Florida quarterback used his visit to Beaver Stadium on Sept. 14, 2013, as a springboard to Thursday night’s draft and his selection by the Jacksonville Jaguars. That day, Bortles threw for almost 300 yards and led Central Florida to a 34-31 victory over Penn State. In its next game, UCF lost 28-25 to South Carolina – and No. 1 pick, Jadeveon Clowney – but then won nine consecutive games to finish 12-1. Which brings us back to Christian Hackenberg. As it stands, on NFL Draft Night 2016 or 2017, Hackenberg will likely be standing where Bortles was standing Thursday night: Hugging it out with Roger Goodell on stage of Radio City Music Hall as the No. 3 selection in the NFL Draft. Or higher. Hackenberg, although younger by 792 days, already stacks up fairly nicely against Bortles. As a high school senior, Bortles was rated the No. 44 pro-style quarterback by Rivals. Three years later, ESPN had Hackenberg No. 1. Bortles first became a starter his third year at UCF, after taking a redshirt that was followed by a sophomore season where he threw for 958 yards and six TDs. Hackenberg was a starter three days before he sat in his first Penn State class of his first fall semester. Bortles is 6-foot-5 and 232 pounds. Hackenberg is 6-4, 234. Bortles was a senior in 2013. Hackenberg was a freshman. Against Penn State, Bortles completed 20 of 27 passes (74%) for 288 yards and three touchdowns, with one interception. It was the 26th game of his college football career. Against Central Florida, Hackenberg completed 21 of 28 passes (75%) for 262 yards, with one TD and zero interceptions. It was the third game of his college football career. Last season, Bortles completed 259 of 382 passes (67.8%) for 3,581 yards, with 25 touchdown passes, nine interceptions and six rushing TDs. Also last season, Hackenberg completed 231 of 392 passes (58.9%) for 2,955 yards, with 20 TDs, 10 interceptions and four rushing touchdowns. It made sense for Bortles to leave for the draft in 2014, cashing a check for $20 million, even though he had a year of eligibility remaining. Hackenberg will face that decision soon enough. At that point, we’re also talking cents -- millions and millions of 'em. The Penn State Board of Trustees legal and ethics committee approved a legal and ethical compliance plan Thursday establishing rules that in part are intended to help prevent and detect violations of the law.